If you've ever found a torn-up bit of carpeting in your home, the result of your cat's mischievous claws, you have probably felt frustrated and wondered: "Why does my cat scratch at my carpet?" Cats scratch because it is ingrained behavior. It serves several purposes, including cleaning the dead husks off their claws, stretching and working the muscles from their toes to their backs, marking territory, and relieving stress. 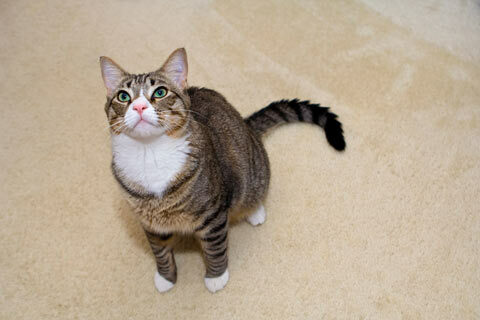 You can learn more in the article "Why Your Cat Needs a Good Scratching Post"
Why Do Cats Scratch Carpet Specifically? Carpet is not generally a preferred scratching substrate for cats. The loops catch their nails, resulting in unpleasant pulling on their toes. Cats also prefer scratching rougher surfaces that more closely resemble tree trunks. However, if cats don't have access to proper scratching posts, they will use what is available to them, usually furniture like couches, dressers, and footstools. These cats will often scratch at carpet as well. If you keep your bedroom door closed at night, shut your cat out of the bathroom while you are using it or close the door to your office while you are working, it is likely to drive your cat crazy. Cats don't like to be left out, and they will often scratch at the carpet outside of a closed door if you are on the other side. If your cat scratching posts are all vertical and you don't have any horizontally-oriented cat scratchers, your cat may scratch at the carpet. You're right: cats need tall scratching posts. They want to be able to stretch out completely, as though they were stretching out against a tree, which is a favorite scratching post of cats in the wild. If you've already got tall, sturdy scratching posts covered in cat-satisfying sisal fabric, then you are really making your cat happy. However, a cat doesn't always want to experience the same scratch every time. Sometimes your cat will want to stretch different muscle groups and enjoy a horizontal scratch instead. This is when she is probably scratching the carpet. How Can I Get My Cat to Stop Scratching My Carpet? The key to creating a great scratching environment for your cat and decreasing her desire to scratch your belongings, including carpet, is variety. 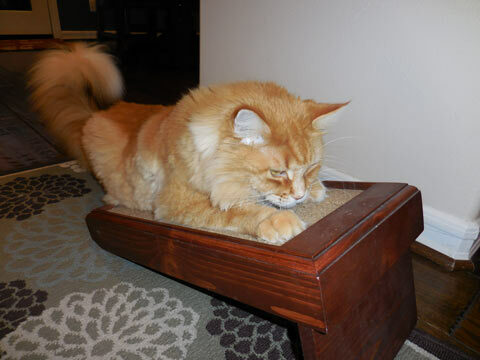 You need tall, sturdy scratching posts, but you also need short, horizontal or angled scratchers. They need to be just as sturdy as the tall posts, and they also need to be made of a great cat-satisfying scratching material. Corrugated cardboard is a common material from which many angled cat scratchers are made. It's a great substrate for scratching because your cat can sink her claws in, and they will slide through smoothly, making a satisfying sound and visual mark. It's also nice and rough, which cats love. Purrfect Post's Purrfect Angle product is made of an even denser, heavy-duty cardboard than most angled posts you can find. It's also surrounded by an attractive wooden frame that offers extreme stability, to handle even the largest cat's scratching needs. You can use it as a flat or angled scratcher, and it breaks down for easy storage and traveling. It's also easily placed under furniture or in small spaces. The key to curbing carpet-scratching with angle scratchers is proper placement. Cats often want to scratch when they first wake up and after they eat. Angle scratchers are great for those times because your cat may not be ready for a full-body vertical scratch then. Place an angle scratcher near your cat's favorite sleeping place and one near her food bowl. Place one near the carpet she has been scratching. Cats also love to discover hidden horizontal scratchers under the bed or in the corner of a closet. You can move them around to provide variety. Another great place for an angle scratcher is at the base of a vertical scratching post. This allows your cat to scratch one way, then the other. If your cat needs a little help finding and using the angle scratchers when you first get them, you can sprinkle a little catnip on them or play with a wand toy near them, draping it over the scratcher during the game to get your cat started.